We are a family of music lovers. While some are more particular, I find myself thoroughly enjoying a WIDE variety of music. 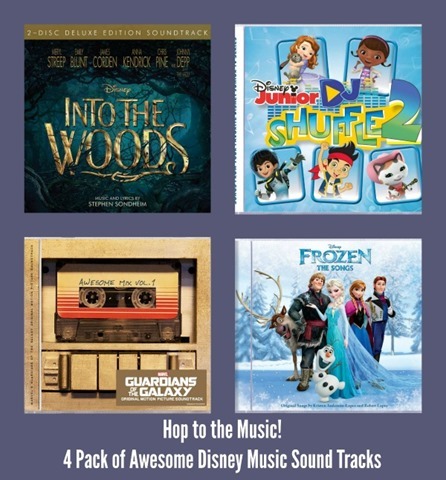 Given our love of music and our love or Disney, I was thrilled to have the chance to 4 Disney Music Sound Tracks which have us hopping to the music this spring. Any of these would make a great addition to a child’s Easter basket, too. We received 4 titles of popular albums in the Hop to the Music package sent us. Learn more about each here and I’ll share what we loved about them. All of the titles are available through Disney Music Emporium. Since ditching cable last year, I find that we are a bit out of the loop on Disney shows. 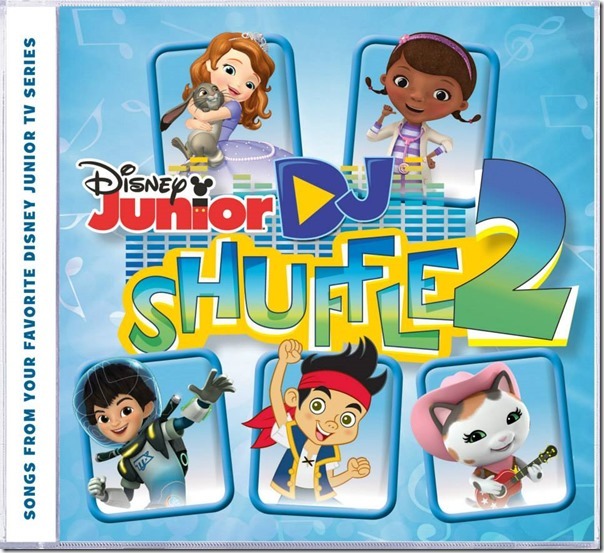 While my 5 year old son hasn’t watched the shows featured on this CD (Sofia the First, Jake and the Never Land Pirates, Doc McStuffins, Sheriff Callie’s Wild West, and Henry Hugglemonster), we are loving having it play in the background while we do ‘fun’ schoolwork like art. Even this mama found some of the songs worthy of dancing around the living room with him. What we haven’t done yet is use the 4 bonus karaoke instrumentals which are always a fun way to see how much of the lyrics you remember. For those of us who sometimes forget, the paper insert includes the lyrics. Also, inserting the CD into your computer will let you download fun activities for the kids. When I started this one up in the CD player, I was reminded of a certain Broadway musical that was extremely popular in the 1980s with a certain masked character. I loved that I could experience the entire production in my car and started to wear out the cassette tapes from continual play. In other words, you get to bring a rather full experience of the Disney production of Into the Woods into your home or vehicle. This comes as a 2 CD set in a fold up paper case and includes a booklet with the lyrics included. Now that I’ve listened to the sound track, I can’t wait to see the full movie. Although, I’ll admit there are times when my imagination seems better than the visuals other people devise. But, having seen stills and promo videos of Into the Woods, I suspect I’ll love it. Like so many other families, Frozen is a Disney movie we purchased on release day. I loved that the storyline could appeal across the genders and many of the songs are fabulous for listening as well as singing along. This album is helping my youngest and I do just that as we can pop it into the CD player and sing the beloved songs from the movie. As “Let It Go” got tons of exposure, that’s the song my teens equate with the movie. However, they were surprised to hear the first song, Frozen Heart, which had more appeal for them and yet they didn’t remember hearing it in the movie. One of my personal favorites is “Fixer Upper” as we can ALL use a little improvement. If I had to pick a hands down favorite from this bundle, THIS is the title. Every single person in the house loved the movie and a few had been clambering for the sound track for a while. For fear of the CD disappearing upon entering the house, I didn’t even tell the boys it was coming until I had the CD in my own hands. There’s a great variety of music from the 1970s that I remember hearing on the radio as a child and teen. My boys love them all as much as I do.In the past week, I think they have popped this one in at least 5 times as well as getting the free digital copy that came (code on an insert in the case.) There’s even a bonus song which did not appear in the movie. See if you can figure it out from the list of songs below! One lucky reader will win the same bundle of CDs that our family was sent. This giveaway runs through April 4, 2015 and is open to US only. Entries are through actions in the Gleam widget below. Which of these sound tracks would YOU or your family enjoy the most? I am most eager to win The Frozen CD. Thanks for the giveaway. I hope that I win. I am most excited about in to the woods and I would share with my nieces! 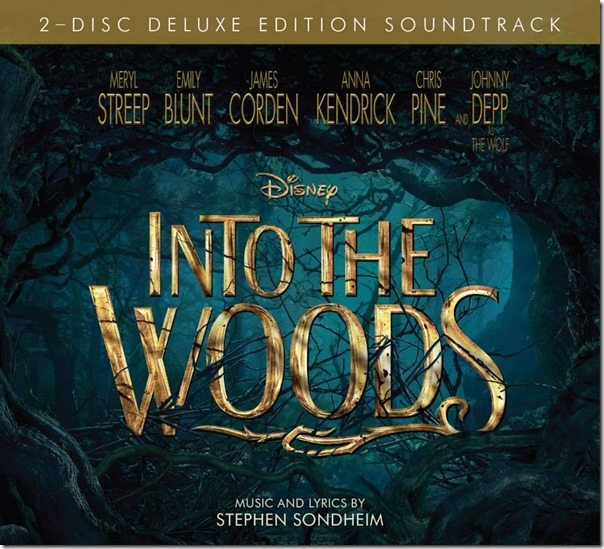 I am most excited to win the into the woods cd and I'd share with my daughters who love music. I'm most excited for the Guardians of The Galaxy Soundtrack! I am most excited to hear Frozen. I'd be eager to win the Frozen one since my daughters LOVE the songs! I am excited for the Awesome Mix Volume 1 from Guardians of the Galaxy. i'm most excited for the Into the Woods soundtrack because i love musical-type music like Wicked and Hairspray, etc! Such a great collection - good luck everyone! I've been dying to get my hands on the Guardians soundtrack so that's definitely what I want! I am most excited for the Awesome Mix Vol. 1. I love Into the Woods. Thanks for the contest. I am most interested in Into the Woods! I would love *any* of these, and definitely ALL of them! the Guardians Of the Galaxy looks awesome. I'm most excited for the Into The Woods Soundtrack! My daughter would love that one! 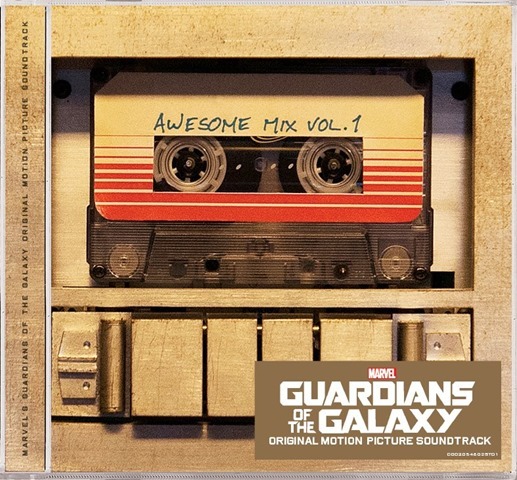 I would be most excited for the Guardians of the Galaxy soundtrack because I love the classic hits! Definitely the Guardians of the Galaxy CD, filled with rock classics! I think I would like the Guardians of the Galaxy the best. I would probably give the other Cds to my niece. My daughter loves all the songs from Frozen, she would be soo excited! My favorite would be Guardians of the Galaxy. 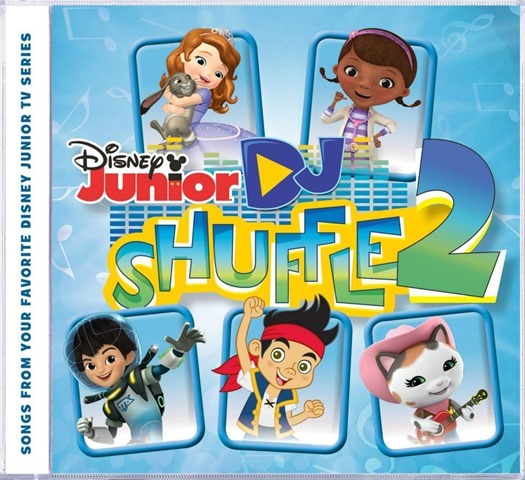 Definitely excited about Disney junior dj shuffle 2. I would be excited to win these CDs for my niece and nephews! Especially "Frozen." Thank you so much! Happy Good Friday! kristiedonelson(at)gmail(dot)com Thank you. 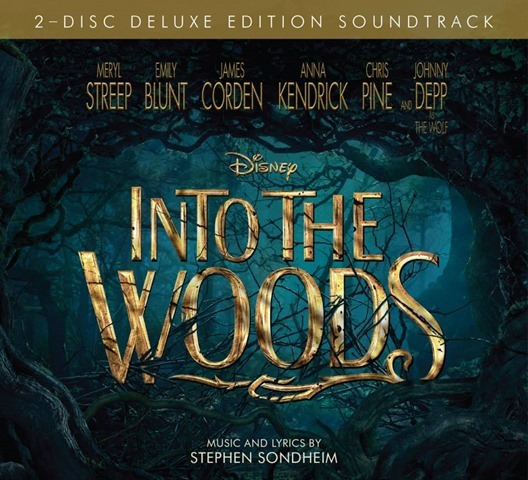 I am most excited about the Into the Woods CD. I am most excited about Frozen. I like the Guardians of the Galaxy Awesome Mix, it has a flare of old school and I wouldn't mind putting it into the cd player for my granddaughter. 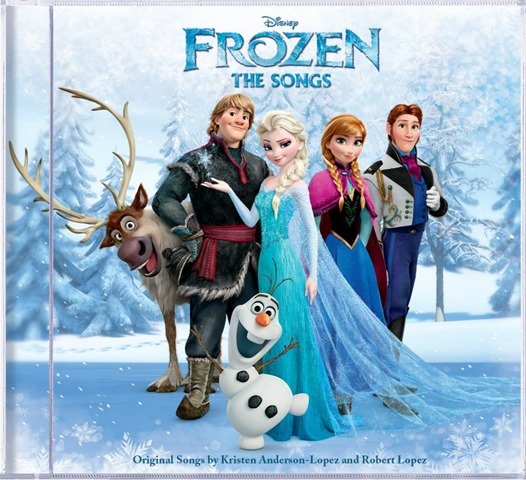 I would give these CD's to my two youngest granddaughters who would be so thrilled especially with the Frozen CD. I would be most excited to hear the soundtrack of Into the Woods. I am looking forward to seeing the movie.